On December 12, 2015, a conference hall in Paris erupted with applause. In the middle of an unusually warm December, world leaders hashed out a climate deal some twenty years in the making. Pictured at the COP21 Final Ceremony (from left to right): Christiana Figueres, Executive Secretary of the UN Framework Convention on Climate Change, Ban Ki Moon, Secretary General of the UN, Laurent Fabius, Foreign Minister of France, Francois Hollande, President of France. After two tumultuous weeks of negotiating (just before the end of the warmest year on record), delegates from 195 countries reached what the New York Times has hailed as a “landmark climate accord.” The Paris Climate Agreement, for the first time in the history of climate policy, mandates that every signatory nation lower greenhouse gas emissions, the infamous atmospheric disruptors. The accord sets a firm ceiling of 2 degrees Celsius (above preindustrial levels) on global average temperature rise and calls for more ambitious efforts to constrain warming to 1.5 degrees. The pact itself certainly merits attention (and has received its fair share), but what I hope to unearth in this post is just how these numbers have been conjured and made their way into the political spotlight. One might suspect that the latest climate science and modelling have generated the two degree limit, bolstering it with the weight of impartial authority. It isn’t an unreasonable assumption, especially given the diligent efforts made under the UN climate policy process to maximize science-policy translation. It isn’t entirely inaccurate, either: the two degree limit was first proposed by scientific advisers in the early 1990’s as a way to maintain the more or less stable climatic conditions that had prevailed for the past 12,000 years. Two degrees Celsius was seen as the maximum permissible temperature increase within which climate would not reel into a state never before witnessed (much less adapted to) in human history. Boasting a properly scientific genesis, the threshold soon gained political traction. In 2009, the two degree objective was enshrined in the much-anticipated Copenhagen Accord, this time cast as a “tipping point” whose transgression would constitute “dangerous” human interference in the climate system. Its inclusion in the Copenhagen Accord granted the two degree limit an almost irrefutable status. Depicting two degrees temperature rise as the boundary line between safe and “dangerous” human interference, however, grossly simplifies the uneven patterns in climate change when observed across the globe over time. The threshold’s elegant spareness has made it a political focal point: simplicity equals actionability, the thinking goes. But the target is more symbolically than materially significant, and it brushes over very real concerns about climate change not by promising bold and decisive action but by advancing the illusion of a global consensus purportedly guided by airtight scientific advising. Just how do climate scientists feel about the two degree cap? After all, it is climate science research that supposedly buttresses this temperature accounting. In truth, many scientists and analysts have all but completely abandoned the two degree limit, dismissing it as the stuff of fantasy rather than a serious and achievable political aspiration. Indeed, the most recent report put out by the Intergovernmental Panel on Climate Change (IPCC) – a body that periodically synthesizes and summarizes the latest scientific literature on climate change for policymakers – casts the two degree target as quixotic. The report quantifies a global “carbon budget” which demonstrates the political will needed to keep temperature rise under two degrees. According to the report, if emissions continue at their present rate the budget will be exceeded in just thirty years. Dishearteningly, leaders all but disregarded the climate budget, and scientists’ recommendations to design policy in accordance with this metric, at the Paris climate negotiations. Although the Paris agreement reasserts the two degree goal, it outlines no concrete allocation mechanisms by which emissions are to be regulated within the global carbon budget, rendering the prospect of a two degree or less rise in temperatures far-fetched. Noting this disjuncture, renowned climate scientist and advocate James Hansen of the Columbia University Earth Institute calls the Paris Agreement a “fraud,” claiming that the vague terms of the accord do not match the urgent portrait painted by contemporary climate science. Interestingly, Hansen and other scientists question the “safety” of the two degree world altogether. In a recent paper, Hansen and 16 colleagues showed that Earth’s major ice sheets are melting more rapidly than expected, making even two degrees rise a perilous gamble. More to the point, there are a host of planetary feedback loops and amplification effects (such as the relationship between extreme weather and Arctic warming) which further complicate the climate narrative. In short, climate science and projections are themselves characterized by a great deal of uncertainty. Now, some good news to end a rather bleak blog entry: many scientists and activists are working tirelessly to square climate politics with the latest findings from climate science. Andrew Jordan, of the Tyndall Centre for Climate Change Research in England, suggests that now is the time to “re-think the climate policy narrative.” Rethinking the climate policy narrative could many mean things, of course, but for activists from small island states on the frontlines of sea level rise, it has come to signify stressing the urgency and differential impacts of climate change. At the Paris climate conference, advocates from small island states pushed leaders to lower the temperature rise objective to 1.5 degrees celsius, a precautionary goal with tremendous stakes. This target is a breath of fresh air. It moves in step with the projections of the latest climate science, boldly calling for the deep social and political change necessary to live with/in the calamity unfolding. Humans need to explore. Not because it is in our DNA – the gene for exploration hasn’t been discovered yet – but because it is essential to our survival and well-being as a species. Scarcity of food and changing weather most likely pushed our ancient ancestors from their African homelands. Religious persecution forced many to flee Europe in search of a safe place to practice. The political pressure of the Cold War prompted us to send men to the Moon. The exploration of space is often sold as “the final frontier,” but there are real discoveries and knowledge attained from these expeditions that can benefit our species. Information gathered from Venus’s atmosphere showed us the effects that chlorofluorocarbons (CFCs) have on Earth’s ozone layer. Planetary scientists were trying to understand how CO2 remained present in such large quantities in the atmosphere of Venus. They thought chlorine and fluorine molecules may have had something to do with it. Models that incorporated reaction rates between chlorine, fluorine and O3 did not significantly affect the amount of CO2 trapped in Venus’ atmosphere, but when the same reaction rates were modeled in Earth-like conditions, the depletion of the ozone layer was discovered. This led to a worldwide effort to reduce CFCs in Earth’s atmosphere. Measuring the effects of dust storms on Mars prompted a team of scientists to model the effects of a global nuclear war. During the Mariner 9 mission to Mars, a planet-wide dust storm obscured the surface of the planet. Instruments on the probe measured temperatures in the upper atmosphere higher than they should have been and temperatures at the surface much lower than expected. Theoretical models at the time predicted that large amounts of debris would be lifted into the atmosphere during nuclear explosions that could block sunlight from reaching Earth for an extended period of time. Using the Martian data and the theoretical nuclear dust clouds, a team of 5 scientists (Richard Turco, Owen Toon, Thomas Ackerman, James Pollack and Carl Sagan) calculated the effect this dirt shroud would have on our planet. They dubbed the results a “Nuclear Winter” and used this information to convince politicians to use caution when discussing nuclear solutions and to reduce our nuclear weapons stockpile. The human race has now sent probes to all of the major planets and some of their moons. Each mission has accrued a wealth of data that may once again be used to benefit our planet. 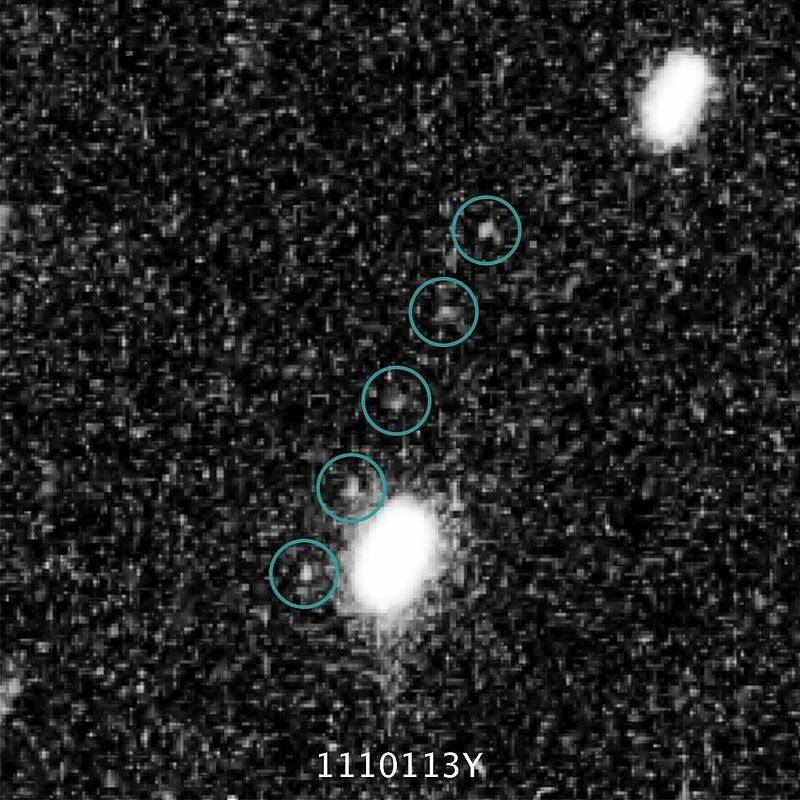 The most recent mission that we are receiving data from is the New Horizons mission to Pluto. Why are Kuiper Belt Objects (KBOs) composed differently than the major planets? What formation mechanisms occurred in the Kuiper belt? How did bombardment of KBOs change throughout the Solar System’s history? How did the Earth lose its primordial atmosphere? As of August 2006, Pluto is no longer considered a major planet. 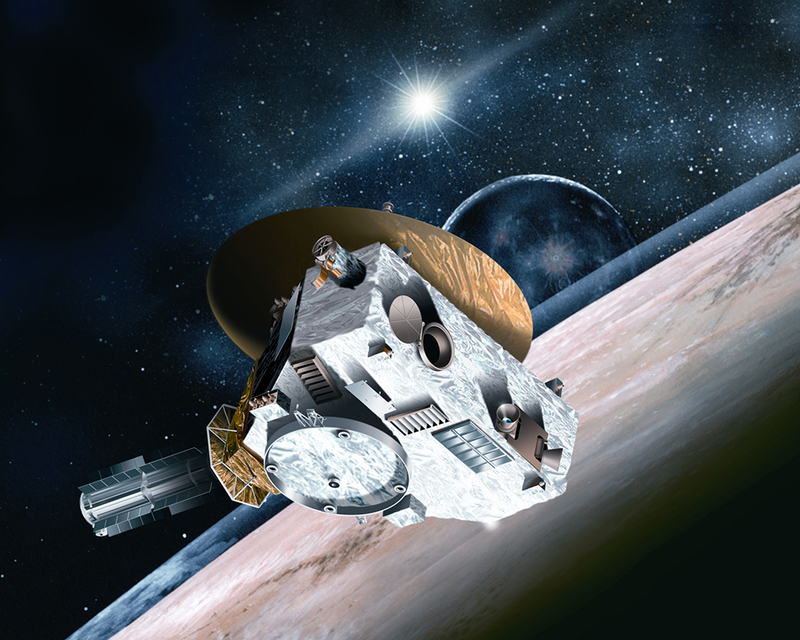 But that does not affect New Horizons’ mission or change the significance of its findings. 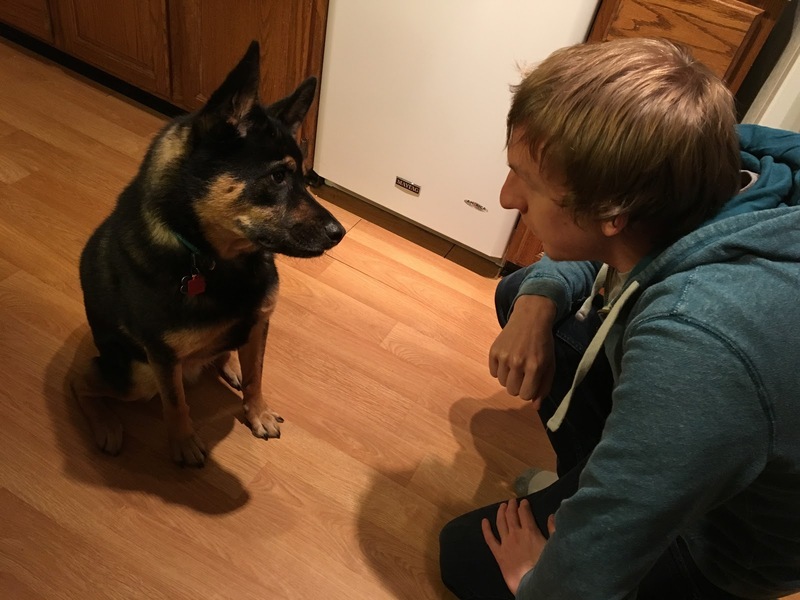 Pluto still holds the answers to many questions we have about our planet. What Could We Learn About Earth from Pluto? Pluto and its Kuiper Belt companions are relics from the formation of our Solar System. They are a pristine conglomeration of materials that orbited our newly formed Sun. This material could have been bombarded by ejecta from a nearby supernova explosion, enriching it and our planet with heavier elements. The chemical composition of these bodies could include organic material that was used to seed our planet with life. There is a lot to learn about the formation of our home from these icy worlds. One of the main goals of New Horizons is to study Pluto’s atmosphere. The atmosphere of the recently formed Earth was full of hydrogen that rapidly dissipated into space. The removal of hydrogen from the Earth’s atmosphere may have played a role in making it hospitable for life. This process is currently happening on Pluto allowing us to study this process in real-time and note its effects on the surface. Organic molecules have also been detected on Pluto and are thought to be present on all KBOs. This could indicate that organic compounds were present at the very beginning of our Solar System’s formation. Where these compounds are located and how much is present in the Pluto-Charon system could reveal if KBOs carried the seeds for life as they were forced towards the inner planets. 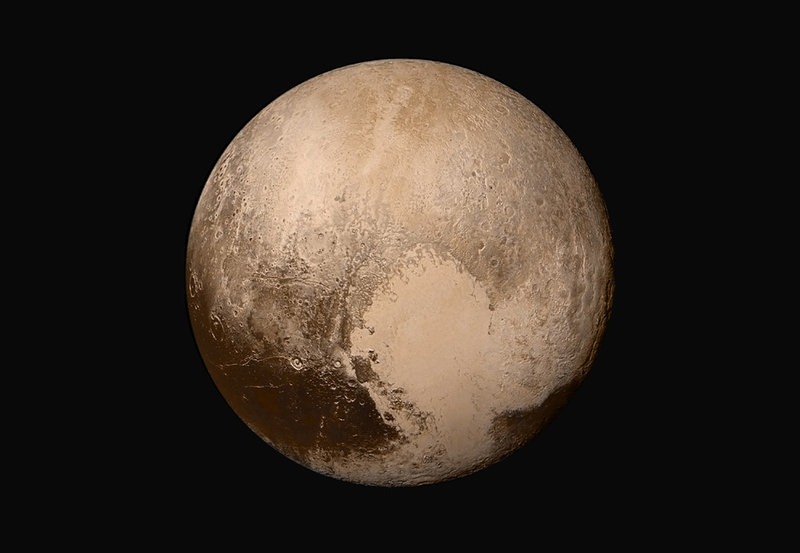 True color image of Pluto taken by New Horizons. The first ever images of Pluto’s surface revealed that it is comprised of both regions unaltered since the formation of the Solar System and those that have been created in the last 10 million years. The range of surface age indicates that Pluto is geologically active, like Earth. So far, glaciers and possible active ice volcanoes have been discovered on Pluto. The beautiful heart shaped region was partially shaped by flowing nitrogen, carbon monoxide and methane-rich ice, just as glaciers shaped parts of North America here on Earth. Images of Pluto revealed a surprising reddish colored surface attributed to the presence of complex hydrocarbon compounds (mixtures of hydrogen and carbon). As New Horizons sped past Pluto, it turned around to capture a backlit image allowing scientists to see in detail, for the first time, the atmosphere. Methane, present in Pluto’s atmosphere, is exposed to UV radiation that breaks down the molecule. This allows the formation of more complex hydrocarbons, which are heavier and fall down to the surface, creating the swaths of red seen in these images. Similar processes could have occurred on a recently formed Earth, creating a chemical mixture of life that rained down onto our planet. Some insight into the formation of Pluto and other KBOs has been gleaned from this new information. There is a surprising lack of small (<1 mile wide) craters on Pluto and Charon, suggesting that the bodies that formed KBOs were much larger than expected. The widely accepted theories have KBOs forming from much smaller objects to create larger ones. This new information has now shifted the focus to those models that used objects approximately 10 miles wide to create the KBOs we see today. This has scientists excited for New Horizon’s next target. Hubble Space Telescope image of MU69. New Horizons has been placed on a trajectory to fly by the 30 mile wide KBO MU69 in January of 2019. MU69 is located in the central regions of the main part of the Kuiper Belt and is considered to be an ancient object due to its relatively circular orbit. Unlike Pluto, which was probably ejected into its current inclined orbit by the gas giants, MU69 most likely spent its entire life in the Kuiper Belt. MU69’s surface is expected to hold an untouched story of the very beginnings of our Solar System. Scientists are also excited by the possibility to study a potential building block of larger KBOs such as Pluto. New Horizons is still transmitting data back to Earth and will be for many years to come. At the time of its closest approach to Pluto, it took 4 hours and 25 minutes for information to travel from the probe to Earth. As New Horizons speeds towards its next target, that time will increase. By the time it reaches MU69, which is over a billion miles from Pluto, it will take 6 hours to receive information from the probe. Scientists are actively analyzing information as it streams in from New Horizons. Who knows what seemingly mundane piece of information will lead to a direct application to a process here on Earth? Just as processes on Venus and Mars opened our eyes to the effects of human activity in our atmosphere, processes on Pluto and MU69 could lead to insights into our planet that benefit our species once again. To learn more about the New Horizons mission and Pluto, visit NASA’s website.